I've finally found the culprit! I suspected all along but got confirmation tonight. The Mystery Component is indeed a coil, and a broken one at that. I made another trip to RaElCo today to purchase parts for a new board modeled on the Vox Jaguar schematic I found the other night. Although slightly different it looked like it should work without a hitch. One of the parts on this schematic was also a coil, but at least I now had a value for it. Imagine my surprise when I quoted said value to Cal and he raised his eyebrows and said "Are you sure"? It seems a 4 henry coil is pretty damn big; much, much larger than the one I currently had on my board. So large that if I was figuring right it would be hard pressed to fit in the space under the cover. He quizzed me about the original coil and I gave him all the info I had. He then suggested that I get the meter out and just check for continuity on the coil. I came home and did exactly that. As I was taking it apart I noticed that it rattled somewhat. I carefully opened it...and one of the wires inside was broken. 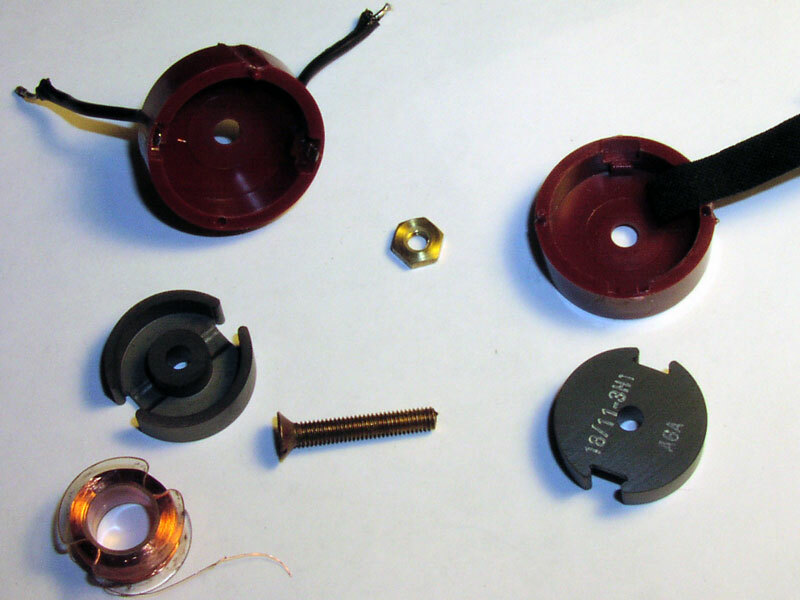 The coil is wound with hair-thin wire, just like a bobbin on a sewing machine. The problem is, the wire was broken on the inside, not the outside. So to repair, I have to figure a way to unwind the coil onto another bobbin so I can pull out alittle wire to reconnect to the terminal, and then rewind the coil, reconnect the wires to the terminals, all without breaking the wire. Then I get to put it all back together and try it out . This is hair-raising work. I hope I'm up to it. The only consolation is that when I'm through we should be able to get a reading on the coil and maybe I can procure a spare, just in case. Some have suggested I just get a Casio keyboard and make do with that.